I Love You More Than Carrots: Wild About: Jumpsuits And Wedges. 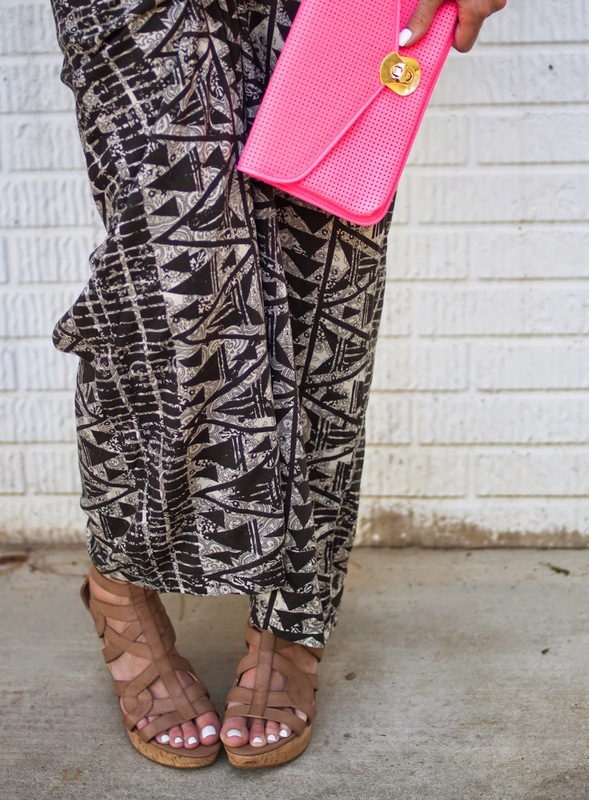 Wild About: Jumpsuits And Wedges. First, let's just state the obvious: a fashion blogger I will never be. Posing is not my strong suit and in certain pictures where I'm trying to show off my awesome wedges, it looks like I'm holding my crotch and doing the pee-pee dance. Awesome, right? As soon as I have four more hours in the day, I promise that I will dedicate them solely to the study of fashion blogging. That said, my lack of skills certainly isn't going to stop me from sharing some of the trends I'm wild about lately. For instance: the jumpsuit. 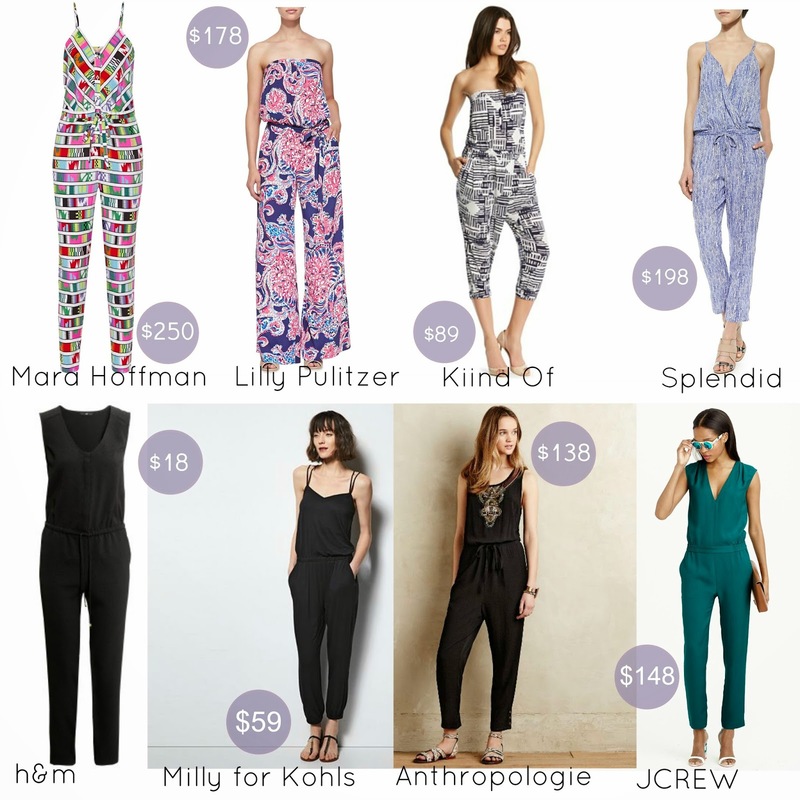 Aside from having to get virtually naked to use the restroom, I have come to love, love, love the jumpsuit trend. As an every day look, a simple cotton jumpsuit feels like I'm wearing pajamas and that's a trend I can always get down with. Even the dressier jumpsuit styles are ultra comfortable and dare I say it, apropos for even the fanciest of summer soirees such as a wedding or engagement party (not that I know anything about either of those things since I am o.l.d old and most of, if not all of, our friends are already married). Do you want to know what I'm loving even more than the jumpsuit trend? Wedges, because those don't involve the losing of any baby weight. Perhaps that's why I've gone ahead and added three new pair to my collection... The most recent addition being this pair from Rack Room Shoes which is currently on sale for $65. Dare I say it, wedges are almost as comfortable as flats but with just a little extra flair. They can easily dress up an outfit and truth be told, I don't even mind chasing three little boys around while wearing them. Below are just a few of my favorite styles that you can also find at Rack Room. And here's what happens when you put two of my favorite things together, coupled with a mom of 3 who is only slightly awkward in front of the camera when her kids aren't in the picture. The hat and jumpsuit were picked up from Target on a whim while I was canvasing one of the local less-popular establishments for leftover Lilly. Can't narrow down a favorite wedge style from above? That's just one of the reasons I love Rack Room Shoes so much. Every day they offer a promotion of "Buy One, Get One 50%" on ALL available styles. This means you can pretty much guarantee to buy two pairs of shoes each time you shop because the deals are just that good. Just last weekend I visited Rack Room Shoes at the Tanger Outlets in Rehobeth Beach, DE and walked out with these Keds and these amazing Skechers for less than $65. All the praise hands, all the heart emojis and all the happy husbands on that one. The Rack room Rewards program also allows customers simple, instant savings with incredible perks such as exclusive discounts, coupons and $15 in rewards for every $200 spent on their every day top brand merchandise. It's also the perfect one-stop shopping spot for every member of our family both big and small. Thanks, Rack Room Shoes for making it easy, stylish and affordable to shop for shoes for my entire family! *I received product for free in exchange for this post. All thoughts and opinions included were honest and my own. Additional financial compensation was not received.